Ripe fruit really needs so very little to heighten its treat factor, especially when it is transformed into such syrupy-soft pleasure when it is baked. Have you ever known a naturally beautiful woman who insists upon always covering herself in an exceedingly thick mask of make-up? If so, you can understand exactly how I feel about the tradition of loading baked fruit crisps with tons of sugar. Preheat the oven to 375°F. Coat 4 5-ounce ramekins with cooking spray. Place the goldenberries in a medium bowl and pour the hot water on top. Let the berries sit for 20 minutes to soften, then drain. Add the orange juice, arrowroot powder if using, lemon zest, and¼ teaspoon of the cinnamon to the drained goldenberries and mix well. Fold in the strawberries and peaches. In a separate bowl, mix together the oats, coconut sugar, coconut oil, and remaining ½ teaspoon cinnamon. 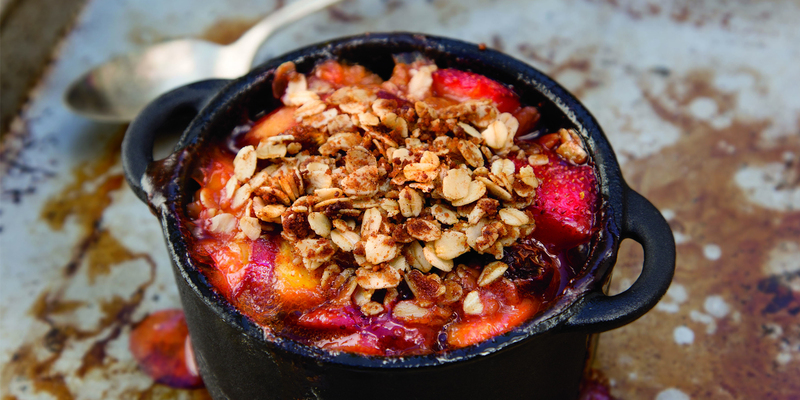 Fill ramekins with the fruit mixture, then sprinkle the oats on top. Bake for 20 to 25 minutes or until the top is golden brown and the fruit is bubbling. Remove the ramekins from the oven and cool for a minimum of 15 minutes. To serve, top the crisp with a dollop of coconut yogurt, if using. Fruit crisps may be served warm or at room temperature. Extra ramekins can be stored in the refrigerator for several days. * Arrowroot powder helps thicken the fruit mixture when baked, without adding sugar (it’s virtually flavorless). **Gluten-free rolled oats may be used.